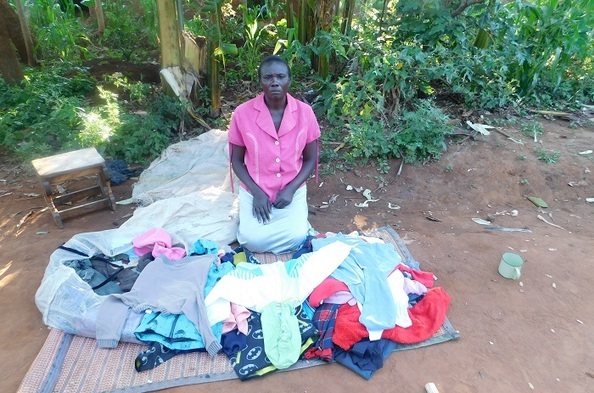 Edinansi is a single mother of five living with her family in Uganda where she has sold second-hand clothes for the past five years. Her biggest challenge is transporting her items from market to market. Despite her hard work, she was forced to use the majority of her profit to cover these transportation expenses. Edinansi didn't know where to turn, until one day she learned about Opportunity International. She received financial training and a loan, which she invested in her business. With a financial influx devoted solely to her business, she noticed sudden growth in her sales. Edinansi is less stressed knowing that she is set on the right path to grow her business and continue to support her family. She is able to provide for the family's needs, pay her children's school fees through the university level, and pay her rent on time. Edinansi is confident that this loan will enable Edinansi's dream of expanding her business, purchasing a plot of land to plant sugar cane and, one day, opening a sugar factory.